Art and creating has always been a part of Kathryn’s life. Her artistic passions began at a very young age, sculpting elephants and other animals from modeling clay. Her interests have continued to grow over the years, dabbling in many different mediums including painting, wire sculpture, decoupage, knitting and crocheting. She began working with polymer clay in 2000 after picking up a Klutz for Kids book on polymer and that was it-she was hooked. Her designs are one-of-a-kind and eclectic at times, ranging from art jewelry to 2- and 3-dimensional artwork and sculptures. She currently teaches for the Glen Echo Partnership for Arts and Culture and the Baltimore Bead Society and has taught around the country. Her work has appeared in Niche, American Style, and Metal Arts magazines and is exhibited and sold at fine arts and craft shows and galleries around the country. She is a graduate of the University of Maryland with a B.A. in Business and a minor in Fine Arts. Her work as a professional fundraiser has taken her all over the country and in 2005, she decided to combine her love of art and her fundraising skills and started Polymer Clay and Creative Arts Fests/Cabin Fever Clay Fest. To date, the event has raised over $12,000 for charities. The event has been a success, offering opportunities for instructors to teach and for attendees, local and international, to learn from some of the best. 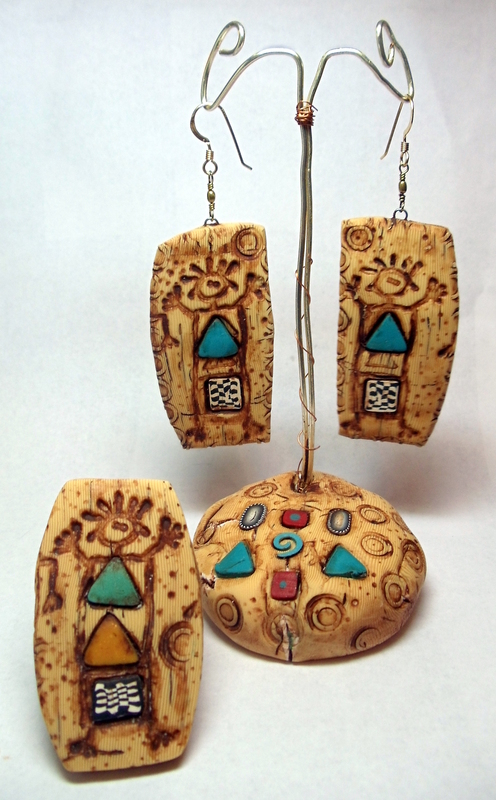 She founded the Central MD Polymer Clay Guild and is a former board member of the National Polymer Clay Guild. Most importantly, Kathryn is mother to a beautiful 2-year-old boy, Christian. Visit her website at www.kathrynottman.com and find her on Facebook here. This workshop is SOOOO packed with fun! We will make earrings, a ring, and a stand to display them! Transfer images onto faux ivory using a ball stylus or a stamp and learn how to make and use simple inlay in your pieces. The photo is one representation of what can be made. Bring your scrap canes and imagination! There will be a small kit fee for the class, but clay will be donated by Polyform Products. NOTE: This workshop will only be taught once during CFCF 2013. Where it says to find Kathryn’s website “here”, the button doesn’t work. Thanks for letting me know. I go through the links, but apparently left off a letter at the end. All fixed now, I think!